Hello to all you fellow brigade commanders out there, now you may be wondering why I said brigade instead of company. Well for starters a company is a small formation made up of a couple platoons or troops (for those tankers out there) compared to a brigade which is made up of different regiments combined to form a battle group. While I won’t get into the history of where combined arms tactics originated as I would need to write a small novel, but for those who are wondering it came with the invention of the tank way back in World War One. Hang on a minute I hear your cry what about previous wars like the Napoleonic era and such others. These were fought by forming a line or column of infantry with artillery in support and advancing to within a certain distance from the enemy and exchanging volley fire with the use of cavalry to break the line to hopefully win the day. These days it has advanced well beyond the scope of Wellington or Napoleon and into something new that was tested in World War One by Monash and proved by Rommel in France during World War Two. You're probably wondering how does this relate to a table top game like Team Yankee. Well let’s start with a 100pt list of British for this example and I’ll talk through the use of the combined formations and its advantages and disadvantages. Now this gives us our core battle group. Next up some airmobile. For the objective holders and quick land grabs, a sprinkle of recon in the form of recce squadron. And last of all Divisional Support. So let’s talk combined arms and how it applies with these three formations. First up our core group of mech infantry will be our objective takers and QRF (Quick Reaction Force), the airmobile will be our objective holders and if need be push to secure objectives and the recce will be our arty hunters and flankers. Support is pretty straight forward to deal with air threats, especially those pesky Hind helicopters. So this is what the plan is to use each formation for a specific task, now the reasons behind my choice is very simple. So let’s start with the Airmobile. I love these guys great all round stats and weapon options. A full platoon gives you three Milan teams, four GPMG teams with 66mm anti-tank and a mortar for smoke. The way I’d use these is to hold objectives in the missions where you have two on each side of the board. I’d give each platoon one of the SF GPMG for extra firepower and leave the commander in the middle with the Milan’s for issuing that Blitz order so I can reposition them to be were the need or to get them clear if tanks get to close. So the goal with them is to hold onto objectives. In missions where there is little or no AA I can then use them as a quick reaction force to claim objectives in the last couple of turns or use them quickly to move to another point on the board to hold an area. Now for the main course, the Mech Company. These little beauties will be able to advance with my Chieftains and try to push of enemy infantry from an objective or act as a quick response unit to plug the gaps. The mech boys have similar stats to the they airborne brethren but get the addition of the Carl Gustav which can be useful to dig out infantry and side shots on tanks. 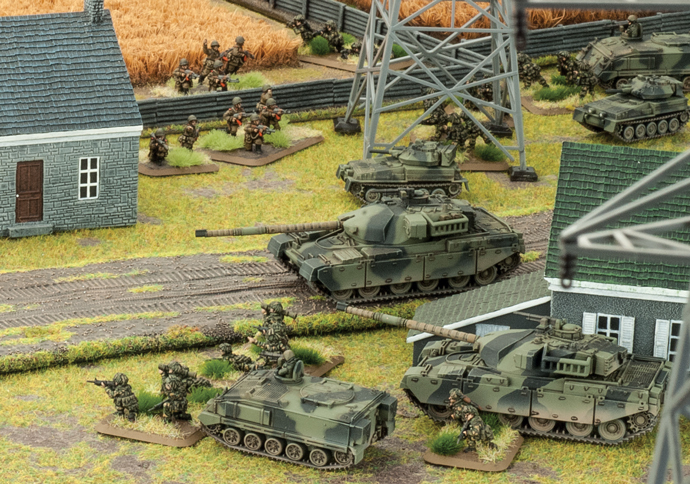 The Chieftain’s part in all this is to clear a path for the infantry to take the objective and to keep eyes on them and away from those soft skinned FV432’s. The Scimitars and the Abbot’s role is to pin the enemy infantry so that your infantry can assault the objective. The Abbots can also fire their guns in a direct fire role where the AT 17 Firepower 1+ will take a toll if the enemy gets too close. At this stage of the game you start to see how combining armour and infantry works for taking the objective. Keep an eye out for Soviet BMP and BTR hordes with either T-72 or T-55 tanks as they are great at doing this quickly. 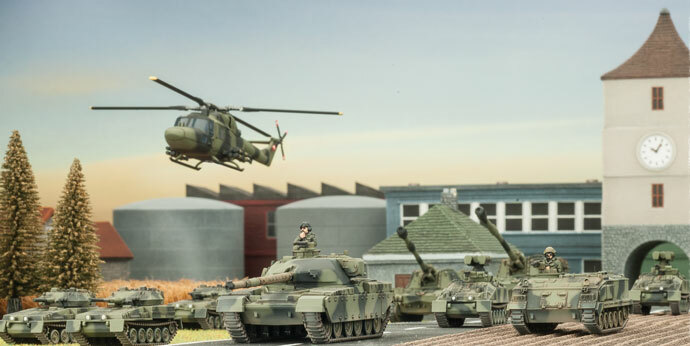 The recce squadrons role is to go after enemy AA and Artillery and to back up the mech as the Striker can sit back and snipe enemy tanks with its great AT of 23 while the Scorpions can flank to get side shots and to take advantage of their 76mm guns with AT 14 firepower 2+ to pop open tanks and BMPs alike. Now the key to success with this list will be deployment, or what to put down when it comes to missions with the delayed reserves. I personally would put on the Airmobile with the support options as this gives you a holding force to hold objectives while waiting for the cavalry to show up. If on the attack it makes it a little easer as you can use everything available. And if used as a combined force will there are enough elements that you will be able to hold your objectives whilst still maintaining the attack. So what are the advantages of multiple formations? For one it allows you to have a more tactical edge in the battle space by providing you with option of a tactical flexible force that can take on most things the enemy will throw at you and two its starting platoon size for deployment allows you to hold on objectives in missions were the delayed reserves rule is used while defending. The disadvantages are that you will have more victory points to give away in missions where VPs are used and small formation size may result in them being broken faster. I hope this gives you an insight on the use of multiple formations and their use and I wish all you brigade commanders luck in your future battles.